Operation Protective Edge has thus far gone relatively well for the IDF. Dozens of terrorists from Hamas and Islamic Jihad have been reported killed and arrested. As of the latest count reported by the IDF, 14 tunnels and over 30 tunnel shafts have been found. These tunnels serve both defensive purposes in order to allow Hamas fighters to appear behind IDF lines to conduct ambushes, and more importantly, for terrorist operations against civilian towns, villages and kibbutzim in the area. Of course, of even greater importance are the smuggling tunnels under the Philadelphia corridor, between Gaza and Egypt, which are the very large tunnels that keep Hamas supplied and armed. The IDF has yet to get to these, and they are of vital importance. There has been at least two attempts in recent days where large forces of Hamas fighters crossed the border through these tunnels (the former type, into Israel) and attempted to infiltrate Jewish settlements in the Eshkol area. Anyone who remembers the recent attacks in Mumbai, the Nairobi shopping mall and elsewhere knows the slaughter a couple of well armed and determined terrorists can inflict on a civilian population. Likewise, even in the US, one can see the efet of even lone and lightly armed shooters on an unarmed population in the infamous and ever more frequent mass shootings. One cam only imagine then, the effect over a dozen heavily armed and trained terrorists wielding assault weapons, machine guns and anti-tank missiles could wreck in a small town. Israel has thus far been fortunate, and well served by its IDF, to escape such a successful incursion. Of course though, in Israel, even in the civilian centers, the would be mass murderers would never find an entirely unarmed population. IDF casualties thus far reported, though tragic, have been relatively light. One soldier was killed, apparently by friendly fire during the first night’s ground operation. Two more the following day when one of the mentioned terrorist attacks ran into an IDF patrol. The IDF jeep was ambushed and hit by anti-tank missiles and heavy automatic fire (wounded soldiers were able to return fire, kill one of the Hamasniks, and send the other 8 scurrying back into their tunnel). Finally, earlier today, two more soldiers, a combat engineer and an infantry man were reported killed in overnight operations. One by gunfire and the other by yet another anti-tank missile. A total of 5 casualties so far, only one of which was apparently caused by enemy small arms fire. The rest either friendly fire or anti-tank missile attacks on lightly armored jeeps. The reported death toll on Hamas (and Islamic Jihad) fighters from last night alone, is being reported at 60. Meanwhile, rocket fire into Israel’s urban centers has dramatically decreased after only a couple of days of the ground operations. Though areas in the south are being very heavily hit, Hamas is having a harder time reaching Tel-Aviv and other larger cities. However today, well placed sources are reporting that the Golani brigade may have suffered heavy casualties relating to ambushes and anti-tank missiles. The Golani brigade, one of the first to enter Lebanon in the last war (2006), suffered similar ambushes in Bint Jbeil. There, the IDF was slow to realize the difference between real warfare, and the police-like actions it was habituated to execute in the West Bank. In the latter, forces tend to advance stealthily, under the cover of dark, in order to surround a home or other site where suspected terrorists are believed to be hiding. The objective being to arrive without warning, as to prevent escape. This is done in a town, that though friendly, is already under your control; conquering a town garrisoned with enemy forces is a very different thing, and in such a situation, advancing unseen into its center is akin to building yourself an ambush. When contact is finally made, the force is surrounded by enemy forces, a situation of its own making. In war, territory must be cleared completely as a force advances, and then territory held. Lessons the IDF should recall well from the Second Lebanon War. Col. Raslan Aliani, the first Druze commander of the Golani Brigade was wounded in fighting earlier today, and is reportedly itching to get back to his troops! The sources are indicating that many Golani troops, including top members of the command structure were ambushed, again with their lightly armored jeeps and/or APCs, being hit with anti-tank missiles and IEDs. As is common in such situations in the IDF, casualties mount as other friendly forces rush in to save their comrades. 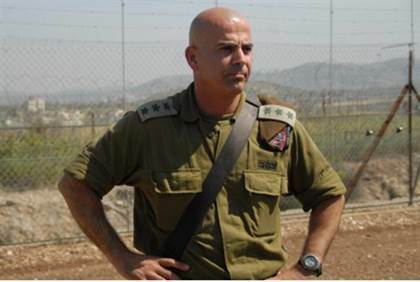 The reported wounding of the Golani brigade commander, Raslan Aliani (a Druze officer in the IDF), may have been part of this larger incident. The incident, may have included scores wounded, and perhaps a heavy toll of fatal casualties. Hopefully, this information will prove to be untrue, or at least exaggerated, but a pattern that needs to quickly be fixes is already emerging. The Lighthouse will update as soon as more information is known. The IDF must stop driving around Gaza! Jeeps and APCs are no match to the new anti-tank weapons that Qatari money is purchasing. Kornets, new types of RPGs, and many other advanced and long range missiles are available to them. The APCs, which in the West Bank provide protection from rock throwing rioters and at most, long range small arms fire, in Gaza, like in Lebanon, are nothing but death traps. When packed into these carriers, infantry loses its use and fighting ability, all the training in the world is useless to a soldier packed into a jeep or APC. IDF commanders must insist their infantry forces are on the ground, spread in tactical formations, and imposing their firepower on the field. Infantry, in combination with real armor (ie heavy tanks), artillery and other special forces can get the job done with very little if any casualties, but the IDF must stop driving around Gaza on jeeps! This is especially true of commanders, who end up too close to the front, on vehicles too lightly armored. Whether these latest report are true or not, something like this is bound to happen unless the IDF dismounts! Finally, there is another even more menacing error that may be occurring here; strategic rather than tactical. The IDF was infamous for knowing the military principle of advance, of offense, of the next generation of blitzkrieg. An enemy must be kept completely off balanced, by continuous advances on against all his fronts, being confused, hit from all sides, and terrified of being surrounded. This causes our Arab enemies to break and rout. During the second Lebanon War, Israel completely abandoned this all important principle. Incursions were indecisive, small, canceled, continuously rerouted… and once ground was finally seized it was all too often abandoned. Politically, the IDF was restrained from advancing too deep into Lebanon. Wars can be fought this way, but rarely won. The enemy is able to regain his balance, gets a sense of the “safe areas” in which the opposing forces are not willing to advance into, and uses them as his launchpad for counter attacks. Meanwhile, the restrained forces start to become sitting ducks, hanging around territory that has not been completely controlled, not allowed to retreat to safe defensive lines (ie the original border), nor to press the attack to achieve a final victory. The Gaza operation must not be allowed to become such a debacle. After two days of relatively fast operations, the pace of the IDF has slowed.. due to its unwillingness to enter the built up areas of Gaza including Gaza city and Khan Younis. The IDF must be allowed to press on to victory, or failing that preferable option, allowed to establish new clear and defensible lines, but it cannot hang out aimlessly around Gaza city, turning its soldiers into target practice for Hamas fighters who can feel completely safe once returning to their built up areas. Progress and victory itself rally the world to support Israel… attrition, delay, indecisiveness and the knowledge that our enemies will remain well and in control after this operation, encourages every player in the world to either temper their support for Israel, or outright oppose it. The political echelon must allow the IDF to act fast and aggressively; having put our boys into harm’s way, we owe it to them to give them every freedom and tool possibly available to let them achieve their goal and come back home in one piece. 6:30 PM Jerusalem local time. Unfortunately, these reports exclusively reported on in the Lighthouse turned out to be true. It is now being confirmed that 13 soldiers from the Golani brigade were killed. No further details have been divulged, but our reports indicate that the incident included a battalion commander being hit by a IED or ambush, and subsequently an APC carrying a force led by the deputy battalion commander was hit by an anti-tank missile. Reports also indicate there was a total of 3 separate incidents leading up to these casualties,though all seem to have involved the Golani brigade. These further details remain unconfirmed. More reserve Paratrooper units should be called up.